Chef Kadko, our culinary educator, started off with a description of the whole menu. 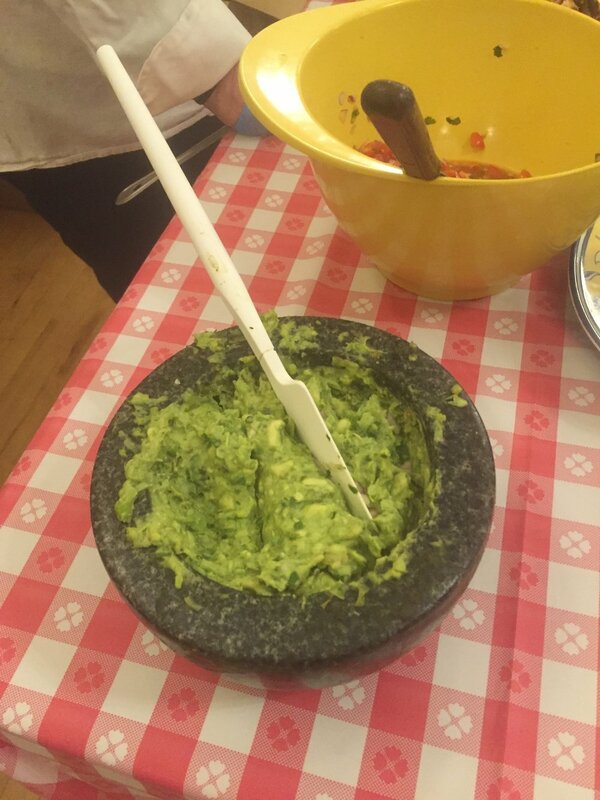 The kids learned how to make authentic tacos from scratch using Masa Harina flour. They learned how to roast poblano peppers using an indoor smoke-less infrared grill. And then learned how to make authentic guacamole using the roasted poblanos..
Like the peppers, the chicken was grilled using the smoke-less indoor infrared grill. The addition of the citrus marinade (made with kerala curry spice and toasted cumin) brought out the and enhanced the flavor of the chicken. The Chef demonstrated how make the pippian verde sauce by sautéing chayote, onions, and pumpkin seeds in a tasty green sauce that when poured over the chicken made us feel like we were in Mexico. One of the participants was a vegan, and we were able to grill the chayote with the spices and served that instead of the chicken. At the end of the class, we enjoyed the spread of Mexican delicacies. We are hoping that this was an inspiration for them to cook at home. These recipes are simple and authentic. The next class starts February 23 at the Summit Elks Lodge.